Federations are showing solidarity with the people of Israel, raising funds for special needs of communities engendered by the conflict, as well as planning and carrying out rallies attended by thousands across Canada, including 1,500 in Toronto last Wednesday. 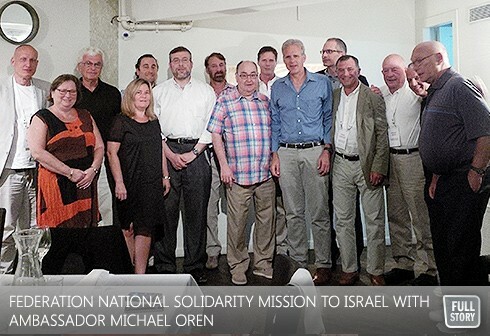 We started to put together a Federation National Solidarity Mission to Israel, to be with the people of Israel at this incredibly difficult time. Great thanks to Ted Sokolsky for suggesting such a mission, Linda Koslowicz, CEO, Jewish Federations of Canada - UIA, Yair Szlak, Campaign Director Federation CJA, Montreal for all his work with people on the ground in Israel to put together a program, together with our CIJA colleagues, particularly David Weinberg, Director of CIJA's Israel office, and Keren Levy, Missions Department, UJA Federation of Greater Toronto. Sunday, July 20th: Participants on the Mission from Toronto, Montreal, Calgary and Winnipeg depart on various flights for Israel. In total, a delegation of 14 for the Mission, plus an additional 3 Canadians for parts of the mission. 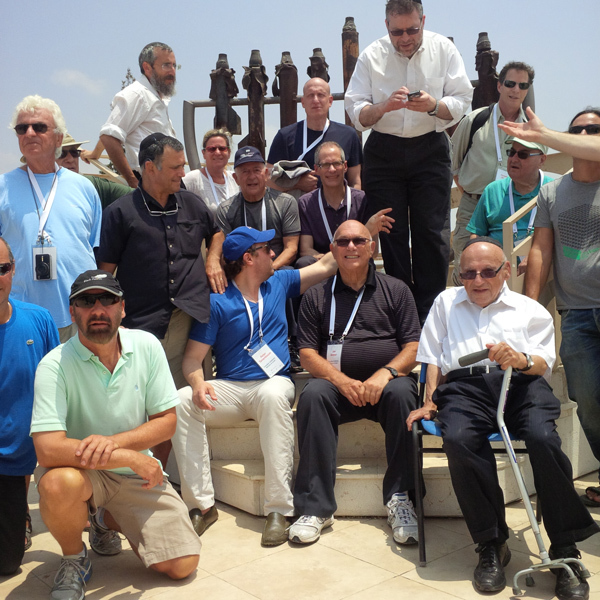 Those participating for the entirety of the mission include: Toronto: Norman Tobias, Joseph Shier, Philip Ladovsky, Peter Tanenbaum, Jack Frieberg, Leanne Spier, Rabbi Daniel Korobkin and Steve Shulman; Montreal: Harvey Wolfe, Ian Karper, and Shlomo ; Calgary: Joseph Spier and Drew Staffenberg; Winnipeg - Elaine Goldstine. 6:45pm: Departure from Pearson International Airport - I have been to Israel 14 times but this is different. I have never been to the country during a time of war or conflict. I also know that two of our mission participants have sons in the IDF. Although the Jewish people is one big family, the reality strikes home when one's son is directly involved. This is the reality of the Jewish state which continues to have to defend its very right to exist in a way that no other state is required to do. 5:10pm: Arrive at Ben Gurion Airport. Immediately upon entering the terminal, the first sign I encounter as well as others in the group tells me that these are not normal times. It's a sign we never see in Canada. These signs can be seen throughout the airport. 5:40 - 6:10pm: Transfer to David Intercontinental Hotel in Tel Aviv. Although we're traveling against traffic, I have never seen the roads this clear of traffic at rush hour on a regular work day. The traffic is more like a late night level of traffic. 6:10pm: Check into hotel. Again, signs that these are not normal times, including instruction sheet on finding shelters in the hotel, and signs pointing to shelters on each floor. Upon check in, members of the Mission delegation hear "it's important you're here" from Lorne Klemensberg of Routes Travel, who took care of our logistics. Lorne relates a situation that today his family members were distraught as they were informed that a school mate of his child was killed in the Gaza conflict. Everything is personal here. Everyone is impacted directly. 7:00pm: - The group meets for dinner and is addressed by Yossi Tanuri, Director General, Jewish Federations of Canada - UIA. Yossi brings home the fact that now the front line is at "home", throughout most of the country in terms of population and gives an overview of the country at this time and how the people of Israel are impacted. 7:15pm: - Once again, the Mission group is thanked for coming to Israel, this time from the General Manager of the David Intercontinental, who stresses the importance of groups continuing to come. The General Manager, David, hasn't left the hotel for two weeks, addressing special needs during this conflict. 7:20pm: - We are joined by Canadian Ambassador to Israel, Her Excellency, Vivian Bercovici. Ambassador Bercovici engages in a full and frank discussion with the Mission participants about Canada's position on the conflict and in the region. The group is grateful that the Ambassador made the effort to join us. - "I'm here because I'm a Jew. There's a war going on and it's important for Israelis to know that there is a Jewish people". - "I'm here to show confidence in the people of Israel". As we go around the table, our Mission hostess Inbal Halperin provides instructions, in preparation for our itinerary tomorrow (Tuesday), in the event a siren sounds while we're on the bus. "The bus will stop, get out and lay on the ground, flat, and cover your head." We complete the evening with Mariv, as one of the members of our Mission group is saying kaddish. 10:30pm: As I make my way to my room I take note of the shelter location down the hall, in the event a siren sounds overnight. Hopefully for the people of Tel Aviv, and our group, that won't happen. It's been a few hours and it's clear, this is not just a regular visit to Israel. Tomorrow we are scheduled to visit both Sderot and Be'ersheva, communities that are part of the "front" Yossi Tanuri referred to and that have partnered with Federation (Sderot - Toronto, Montreal - Be'ersheva) for many years. We would rather be here in better times but are honoured to be with the people of Israel at this very difficult time. Today we are on the move, away from the hotel, to within less than a kilometre of Gaza, to Sderot and then later, the capital of the Negev, Be'ersheva. Toronto's Peter Ekstein joins the group for the day. 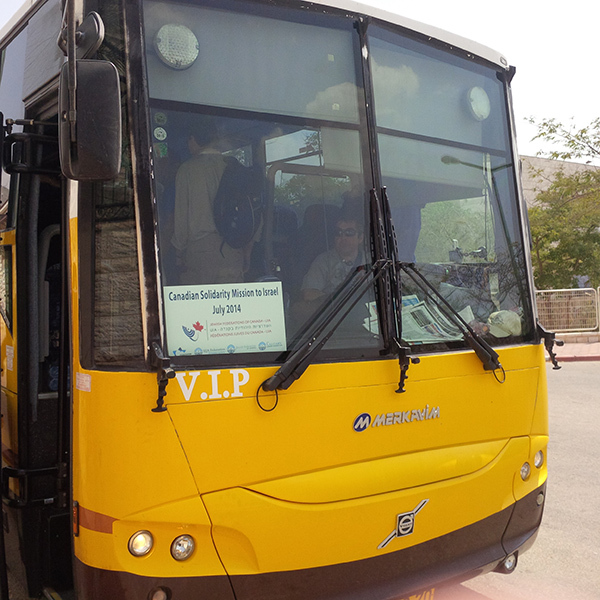 8:40am: We are on the move and told by our excellent guide, Tzvi Sperber, who moved from England to Israel decades ago, that we are in a bullet-proof armoured bus. This is not standard issue for a mission but these are not normal times, nor is this a typical mission. We are also given revised instructions, based on the armoured bus, that if a siren sounds stay on the bus and lean forward in your seat, much like the instructions given by flight attendants at the start of a flight in the event something goes wrong. 9:20am: Driving in the vicinity of Ashdod, we see that cars ahead are stationary at the side of the road and, a moment later, start moving. Tzvi tells us that we just missed a siren which sounds when rocket or missile fire from Gaza is detected. Cars and trucks continue driving in an orderly way. In Canada and virtually any other country, civilians wouldn't have just continued on with their lives. However, here, there is no choice. People must continue with their lives after what would be a defining trauma in Canada or other western countries. The people of Israel are strong. 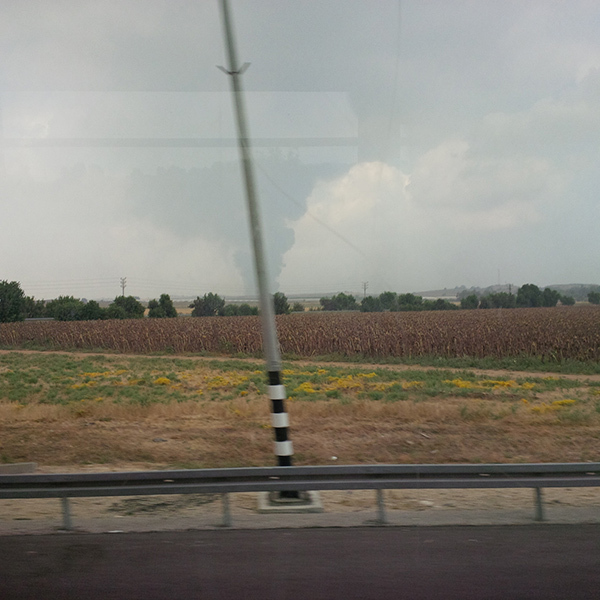 9:30am: As we drive, closer to our first destination of Sderot and closer to Gaza, we see plumes of smoke rising as we all gaze through the bus right side windows.On a drive shorter than Toronto to Barrie, we have already had two reminders that these aren't normal times - even for Israel. 9:40am: We arrive in Sderot, a partner community of UJA Federation of Greater Toronto for many years. Life continues. The city limits are less than a kilometre from the Gaza border and our first stop is a market with fruit and tchotchkes. As we leave the bus, there is a caveat to remind us of the situation. Tzvi points out the two closest shelters. If a siren sounds "we have 15 seconds". Despite it all, the market is full of activity and life. The only yelling is by the young hawker selling grapes. 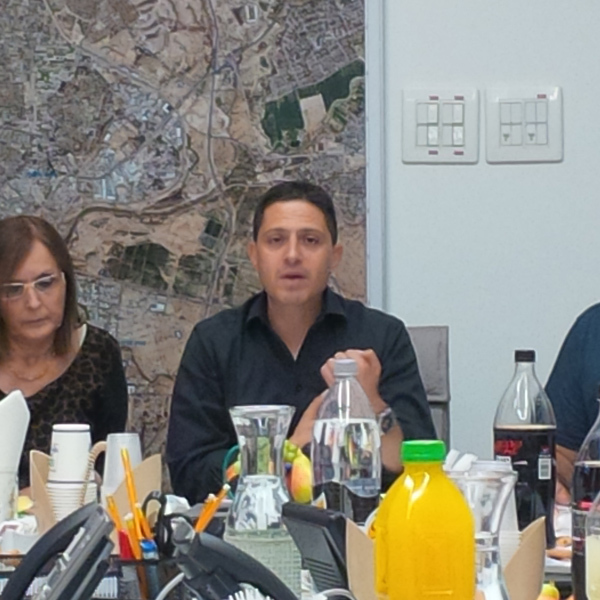 10:30am: After a short drive, we are briefed on Sderot, today - literally - by Canadian Federations' representative in Sderot, Eddy Azran, and the Mayor of Sderot, Alon Davidi. 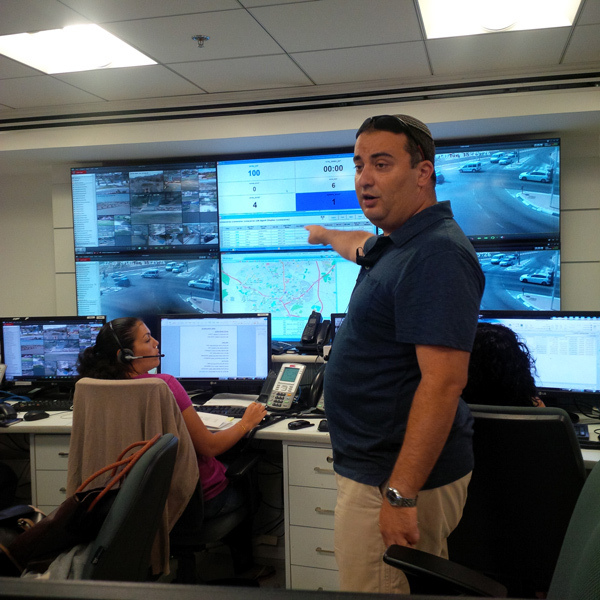 We are in an underground security control room for the municipality, with outdoor cameras showing various points in Sderot and one side of the room comprised of a wall of screens. 10:40am: We hear from Eddy and Alon about UJA Federation of Greater Toronto's partnership with Sderot. Even in Israel, Sderot is exceptional in terms of the way it is targeted by terror rockets and missiles. It is hard to imagine, but the Mission participants are told that the people of Sderot have endured more than 30,000 rockets in the past 14 years. Yet, there are 25,000 people in this vibrant small city which represents the strength of Zionism, the strength of the people of Israel and the strength of the Jewish people. 10:45am: There are more than six million Jews in this country but everyone seems to know everyone else. 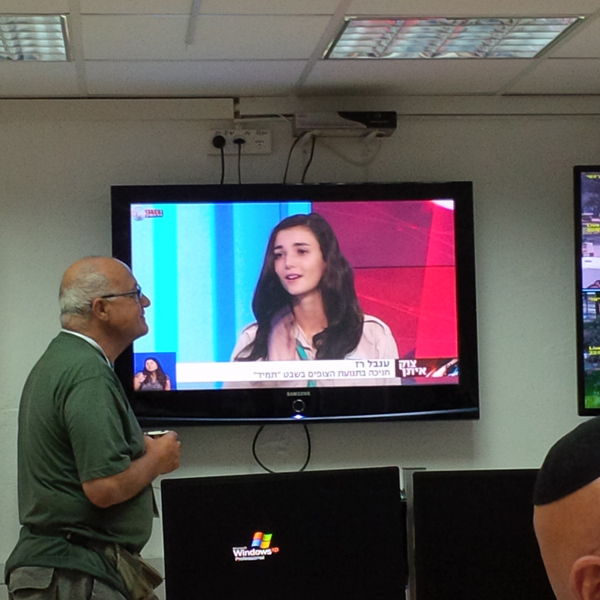 A perfect illustration is that the meeting pauses as one of our participants, an Israeli, Shlomo Toledano, who is with the Mission and has worked extensively to help the Campaign of Federation CJA in Montreal, declares that his granddaughter is on the TV screen being interviewed on the Israeli news. We can't hear what Shlomo's granddaughter, who is attired in her Israeli Scouts uniform, is saying. We see a proud grandfather, a beautiful granddaughter on TV and a country where, seemingly, everyone is connected to everyone. 10:55am: A visitor, many are familiar with, Kurt Rothschild enters the room and sits next to Eddy and Alon. The respect of all those present is crystal clear. This is a man who has dedicated his life to the Jewish people and is a Zionist in the best sense of the word. After being a community leader in Toronto for so long, Mr. Rothschild made aliyah - post 90 years young. 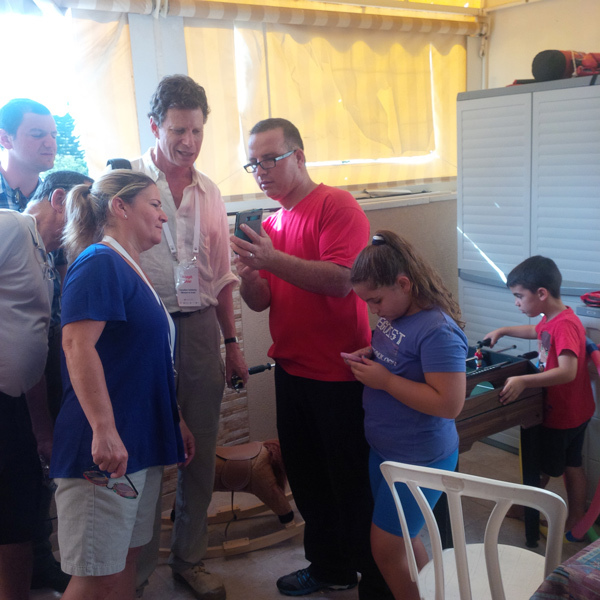 He is proud of Israel and proud of the role Federation plays in Sderot. Even post - aliyah, Kurt continues to support the work of UJA Federation of Greater Toronto. All are gratified that Mr. Rothschild was able to join us. 11:00am: Eddy and Alon tell us that Sderot had 25,000 people in 2001. Several thousand left over the worst years of rocket fire but the community has bounced back with approximately 25,000 today. We hear that the partnership of UJA Federation of Greater Toronto with Sderot, facitlitated by Jewish Federations of Canada - UIA, has been an important factor. Just one example: funds from UJA ensures that the Community Centre in Sderot can be used by children and people of all ages, as in 2009 a rocket proof roof was installed through the efforts of UJA. The Community Centre attracts 600 children each evening. We're told that's essential to normalizing life in a city that has received repeated rocket attacks for 25 consecutive days. 11:40am: Now a visit the local youth centre that's also fortified for protection against rockets. It's clear that young people from within the community form the spine of the community. Development of young leadership has been a cornerstone of the UJA Federation partnership. Young leaders are in action as we see a young leader coordinating activities and supervision in local shelters. The organization of those are posted on large sheets throughout the room. There is no doubt that Israel asks a lot of its people and its young people are no exception, not just in terms of serving in the IDF, but also in terms of leadership in the community. 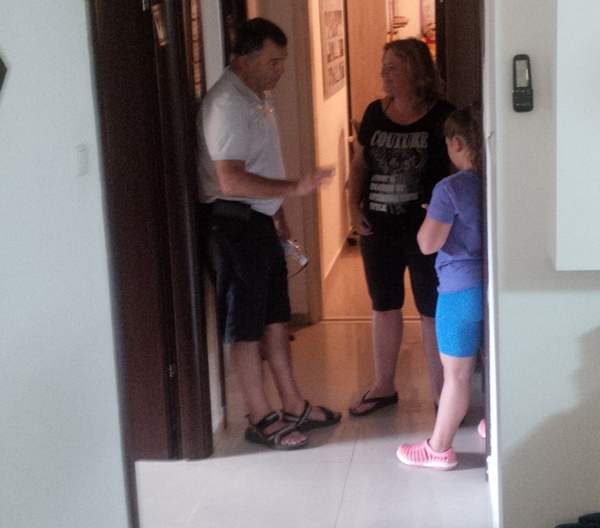 This leadership is making a major difference in Sderot. 11:50am: Walking to a lookout over the city, we cross paths with soldiers who just returned from Gaza. 11:55am: As we walk on the property of a Jewish learning institution, and look out on the city, we hear "boom, boom, boom". This repeats several times. Gaza is literally "up the street". We look out on a city that would be a ghost town in almost every other country. In Israel, Sderot is alive. 1:15pm: Driving out of Sderot, the bus stops in front of the Community Centre that operates in good times and bad and, because of the Federation partnership and the reinforced roof, can operate like community centres operate in Canada, where we have rain, snow and, at worst, hail, falling from the sky rather than rockets targeted at us. I explain to those on the Mission that I have had the honour to visit the Community Centre on many occasions. It houses every kind of activity imaginable, from theatre groups, to dance lessons, to Brazilian Jujitsu, to a community kitchen group. As Federation donors, we leave Sderot knowing that the people here are extraordinary and we have played a role in the history of this community and continue to play a role. By doing so, we play a role in Jewish history. 1:50pm: Our bus arrives at the Moshav of Brosh in the Regional Municipality of Bnei Shimon. Once again, Yossi Tanuri addresses the group and describes the collective impact of Federations in Israel and the difference we make in times of quiet and times of crisis. One of those places of impact is Bnei Shimon. Arie Levy, Director of Israel and Overseas / Israel Office Federation CJA Montreal, talks about the Montreal Federation CJA partnership with this Region and with Be'erheva. Mayor Sigal Moran comes to say "thank you" for the efforts of Canadian Federations and their donors, particularly Montreal which is a partner of this Region. We see a small mobile bomb shelter, that costs $18,000 to build. How symbolic. Making it safely to the shelter can be the difference between life and death. Unlike Sderot where there is 15 seconds once one hears a red alert siren, this community's location just a little further away from Gaza affords residents 30 seconds from the time a siren sounds. 2:15pm: Arie Levy joins us on the bus for the trip to Be'ersheva. Our driver Yossi pulls to the side of the road for a moment as we're told a siren is sounding, even though I hear nothing. Arie, a transplaned Montrealer who now lives in Be'ersheva, tells us of the difficulties for his own kids caused by the terror threat from Gaza. His oldest, 10 years old, is experiencing constant rocket and missile fire from Gaza for the third prolonged period in her short life and won't leave the house. Another of his children now wakes up several times a night. The youngest, three years old is now asking for the pacifier she gave up a year ago. 2:20pm: Arie tells us that through it all, Be'ersheva's population has ballooned from 60,000 when the Federation partnership began more than two decades ago, to well over 225,000 today. 2:30pm: Be'ersheva service and emergency workers are being called on around the clock. School is out for the summer and their kids need to be kept busy. We have the happy task of meeting kids at this special camp for children of service and emergency workers at Matnas Yad Alef, a community centre supported by Federation CJA. Israelis try to keep life as normal as possible even in a time of war. These happy beautiful children and civilians of all ages are targeted by Hamas. There can be no acceptable answer as to why. 2:50pm: Arie's colleague in the Montreal Federation CJA partnership, Shani, takes the mic on the bus to tell us her story. Shani is a Sabra, 28 years young. She is married and has a child less than two years old. Shani's husband just got called up to the reserves and Shani is alone. She is also pregnant with the couple's second child. Shani is relieved as she received a text at 5am today from her husband telling her that he is ok. She also shows resolve by expressing the need to do everything possible to ensure the rockets stop and terrorist tunnels are undone, even though that means continued anxiety about her husband. 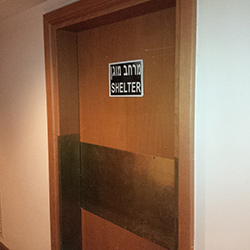 3:00pm: We go underground at the Be'ersheva municipal complex to the situation room, filled with phones and people to answer them in response to emergencies. The room is filled with large screens on the front wall, where the entire city can be monitored. We receive an explanation of how all this works and the response in the event of an emergency. 3:10pm: The Mission delegation moves to the room next door which can be termed "the situation room" where municipal leaders come together in times of crisis to determine strategy and execution. We are introduced to Be'ersheva Mayor Rubik Danilovich who has already served the city for six years and is very popular. The Mayor, speaking in Hebrew, is extremely passionate about the strength resolve of his city, Israel, and the Jewish people, and is thankful for the partnership with Federation CJA in strengthening the social fabric. His comments are translated but he is able to convey the core of his message without the need for the listener to understand a single word. 3:25pm: The first truly audible siren we have experienced in our short time in the country rings out. There is a rocket or missile destined for our general area, to be intercepted by Iron Dome. We are assured that this is a safe room, as is the entire emergency response portion of the complex. Mayor Danilovich continues to inspire, describing how his city has become larger, stronger and more vibrant. A short time later we leave feeling the "capital of the Negev" is in good hands. 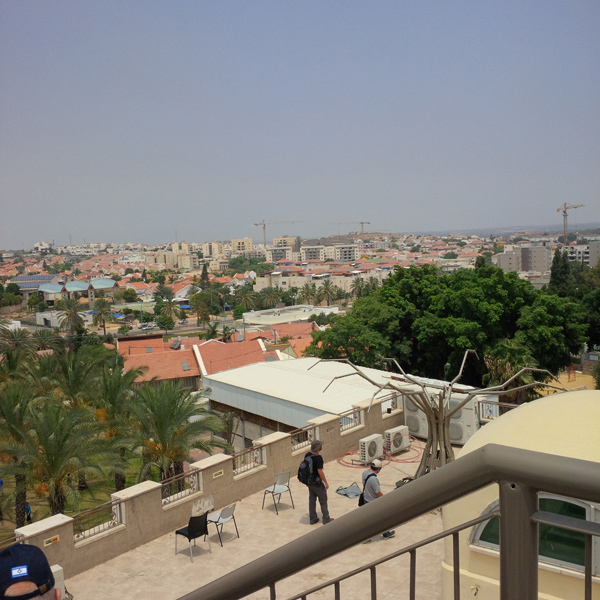 4:30pm: We visit a economically challenged neighbourhood of Be'ersheva, with housing built in the early years of the city to accommodate large numbers of olim quickly. This housing stock houses 40% of the city's populous, and is generally without shelters or safe rooms. As a result, there are neighbourhood shelters in close range of these older apartment buildings. When shelters are not in use, vandalism occurs. The city can lock these shelters but it takes hours to reopen all of them - not a good option when a new round of attacks occur. Start up nation has the solution! One of the two developers of the "GateKeeper" system explains. A locking systems is installed. When sirens sound in a particular neighbourhood, an electronic signal is sent to locks on area shelters to open. They lock once again from external entry once the alert passes. The shelters serve their purpose and are guarded against vandalism and other nefarious activities. Another challenge solved by Israeli ingenuity and Jewish kop. 6:00pm: The bus arrives in front of a typical middle class apartment block in Ra'anana. This is the most emotionally difficult point in this Solidarity Mission so far and not on our itinerary. Earlier in the day our tour guide Tzvi Sperber, explained that a "lone soldier" (one who doesn't have parents in Israel) was killed in the War. This lone soldier, Sean Carmeli, was a young man who grew up in Texas, moved to Israel when he was 16 but his parents moved back. More than 25,000 attended the funeral, almost all of whom did not know Sean. We also didn't know Sean or his family but, like so many who attended the funeral and shiva, wanted to let his family know that we are indebted to him and to them. We hoped to give some comfort. No words can describe his parents' pain, evident in the few minutes we were there. None of us on this Mission shall ever forget Sean, or his family, even though we will never meet him. 6:55pm: On the way back to the hotel Tzvi informs the group that 200 immigrants from the United States arrived in Israel today to start a new life. 7:05pm: As we drive beside Tel Aviv's Mediterranean coastline, people are on the beach and tayelet (promenade), but not as many as usual. Life goes on and this one day - which seems like many days packed in one - sends home the message that this is a remarkable country. One of a kind. 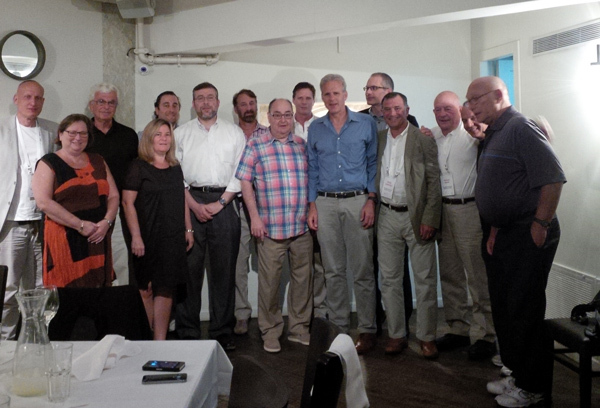 8:30pm: The Mission participants gather at a Tel Aviv restaurant to have dinnner and hear from a true renaissance man, Michael Oren, Israel's former Ambassador to the United States. He is an acclaimed historian, author, academic, diplomat, commentator and a gold medal winning rower at the Maccabiah games. Ambassador Oren was, at one time, one of those olim who moved to Israel from the US. An aliyah story of immeasurable success. - The Iron Dome system saves both Israeli and Palestinian lives, and without this detection and interception system, Israel would be taking mass casualties and, in order to save lives in Israel, would have no choice but to be less careful in taking out weapons, terrorist tunnels and other attack sites in Gaza. - The US position on the Airport is something completely new. 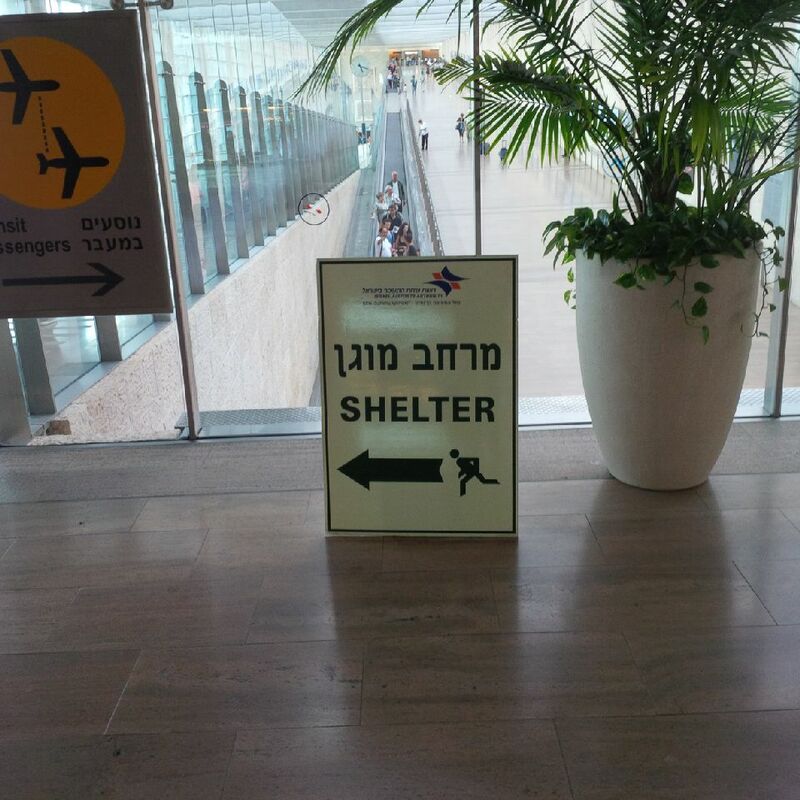 Ben Gurion Airport was not closed during the 67 or 73 wars. - This is the largest Israeli military operation since the 1973 Yom Kippur War, with 60,000 - 70,000 reservists called up and a regular army of more than 100,000. - There is always more than a 100% response to the call-up of reservists as more people show up than are actually called up. - This is "a war of national survival". As of tonight, 28 soldiers are dead, including three lone soldiers, one of them being mourned for at the shiva we visited this afternoon. In Ambassador Oren's view, Israeli society understands that a price has to be paid, although it is terribly painful. - There are shows on Israeli TV and radio tailored to children, the blind and the hearing impaired, focused on how those groups are to deal with a missile attack. - The most important factor in Israel's favour is Israeli society. Michael Oren's last comment echoes what was clear to me and others on the Mission, after an illuminating, inspiring and, at the same time, challenging day. Today is the last day of the Solidarity Mission before participants go their separate ways or depart. We are all playing a guessing game as to whether flights the participants have booked will be cancelled. The professional team in Israel, Toronto and Montreal have been calling the airlines and travel agents to ascertain the situation. Torontonians Joy Kaufman and Sheldon Potter join the Mission for the day. 7:30am: After breakfast the group meets with Miri Eisen, former Spokesperson for Media Affairs in the Prime Minister's Office. Like Michael Oren, Miri came to Israel from the United States, although she made aliyah with her family as a child. 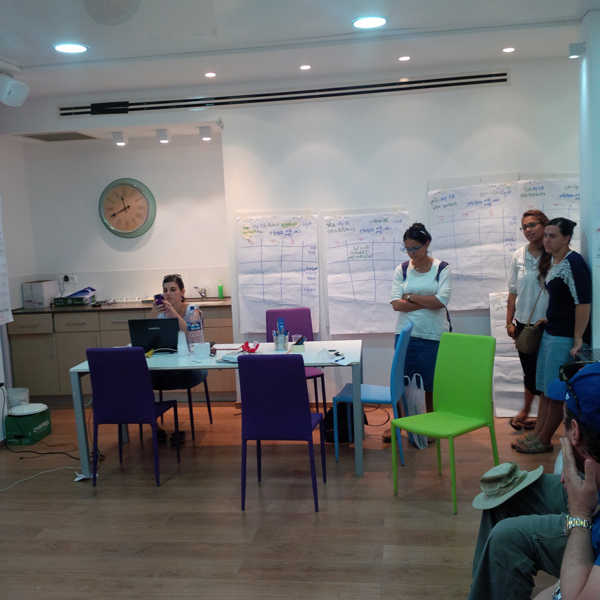 Like many other Israelis the Federations Solidarity Mission has met, Miri thanks the group "for coming here right now as this is what we need, despite family telling you you're crazy". Miri Eisen talked about the tunnel dimension of this conflict and the serious security threat it poses. She reminds the group that Gilad Shalit was kidnapped through a tunnel between Gaza and Israel. - For the last 16 days Israelis have been doing what they have been told - stay in the house or close to a shelter. If in a car, get out and lie down flat and cover your head. That's one reason why there have been so few civilian casualties on the Israeli side, beyond Iron Dome. - It is painful to see photos of soldiers on the front page of the paper every day (as she holds up a copy of Ha'aretz showing photos of soldiers who have been killed). "They're us." - I feel sorry for the people of the Gaza Strip, even though they don't feel I have a right to exist. - Israel has a right to defend itself and stop people from killing us. 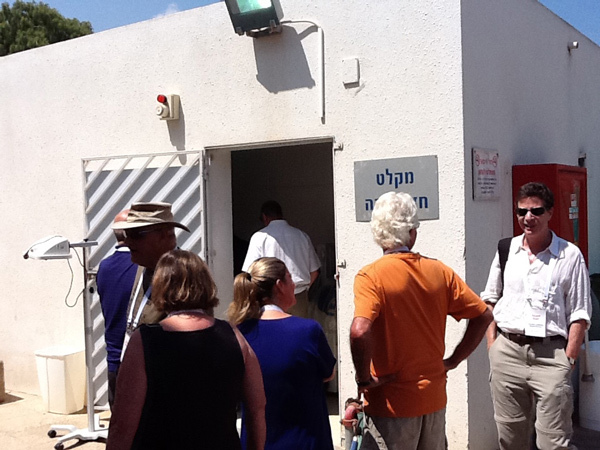 9:30am: We arrive at a place of healing, Barzilai Medical Centre in Ashkelon, and meet with the CEO, Dr. Hezi Levy. Distance from Gaza is measured in how long it takes a missile to reach any given point. Here it is 15 seconds. Dr. Levy, formerly Surgeon General of the IDF, talks about "what it's like to operate a hospital in a crazy reality." The hospital was built in 1961. No one thought missiles would be aimed at civilian hospitals. At 12km from Gaza, the hospital is within range of Qasams and Grads. Dr. Levy describes the special arrangements that have to be made during the conflict. In two years a new totally fortified building will be completed with 300 beds, 10 operating theatres, pediatrics and neonatal intensive care. 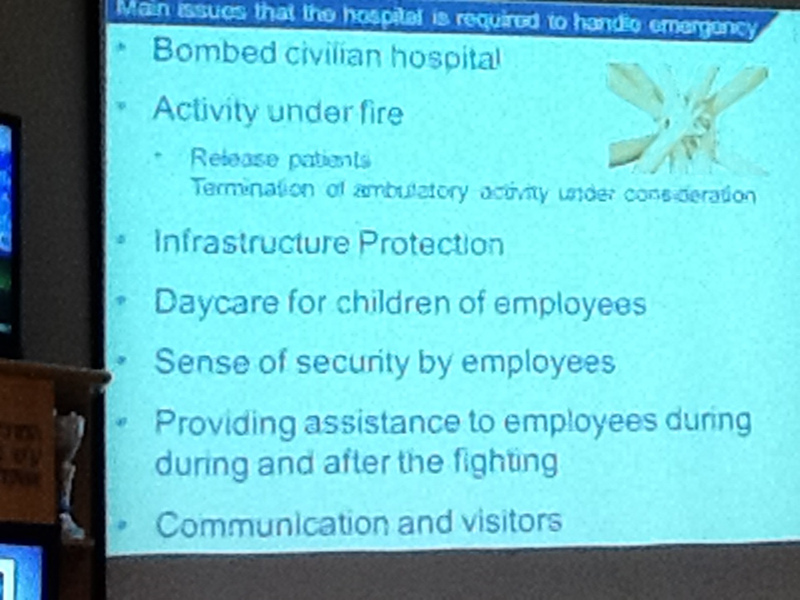 9:45am: Dr. Levy describes the type of injuries that the hospital has to treat, arising from the conflict. I've always been curious about what it means when I read in the Jerusalem Post that a soldier or civilian is "lightly, moderately, or severely injured or wounded". Dr Levy explains Barzilai Medical Centre's parlance. "Severe" or "critical" injuries are those that endanger life. "Moderate" injuries pose a danger to organs. An amputation is classified as "moderate". This is clearly just a medical definition. "Mild" injuries are anything less, such as wounds that don't pose a danger to organs or life itself. 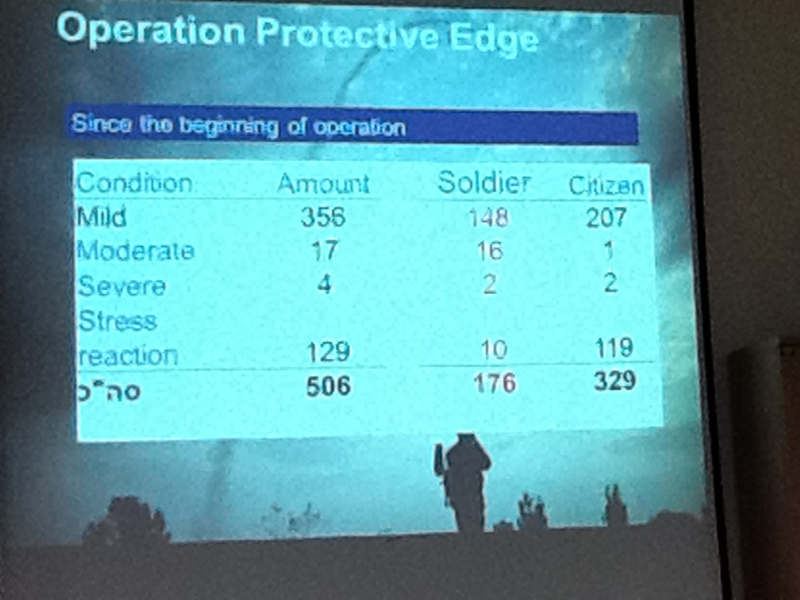 Dr. Levy reviews the stats on the type of injuries treated at Barzilai since the war began. 10:15am: Dr. Levy's presentation ends and we leave the room for a tour of the hospital. As we begin, Dr. Levy speaks about the fact that the hospital treats all the same way, whether they be Israeli soldiers or civilians or terrorists who are injured. He also tells us the tour will focus on the various wards that were moved, at the start of the war, from unprotected areas to fortified areas as there simply isn't enough time to move patients in the event of a rocket attack. 10:20am: A siren wails and we are directed back 10 metres to the room where Dr. Levy's presentation took place as it is a safe room. 10:25am: The hospital tour resumes. 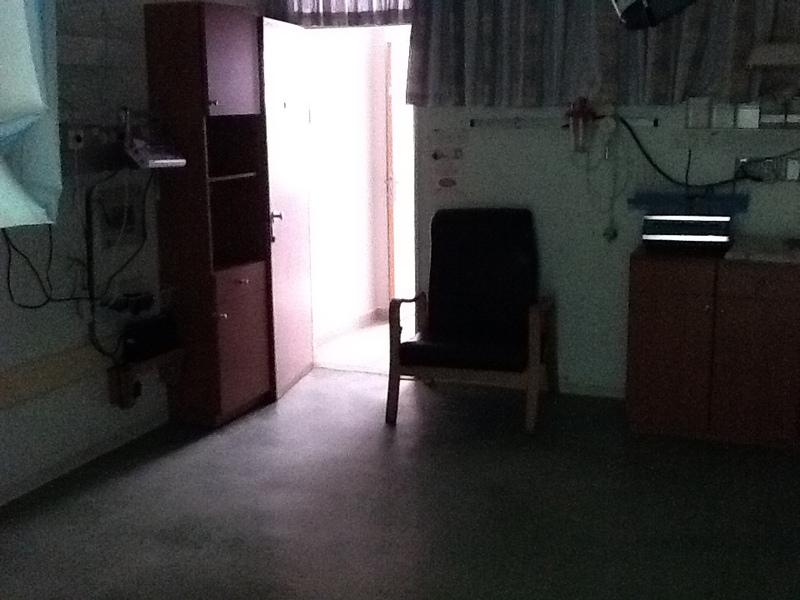 We visit what was the maternity ward, with rooms now sitting empty. 10:35am: We venture outside to a standalone structure that, from an external view, looks like a bomb shelter. 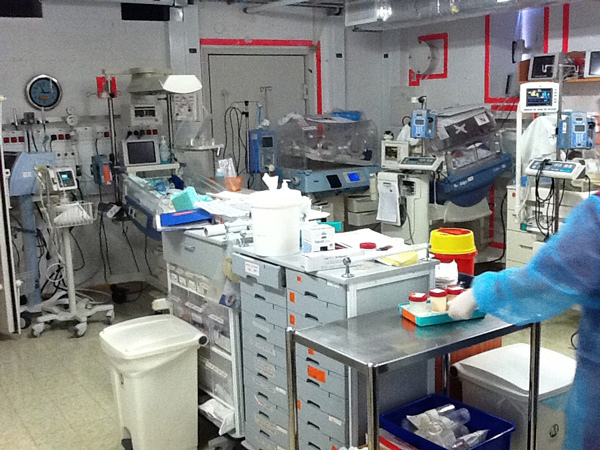 Inside, on a temporary basis, it houses all the equipment necessary to care for premature infants in a fortified building. 10:50am: The group enters a ward where numerous injured soldiers as well as civilians are receiving treatment and recuperating. All those participating find this part of the visit very meaningful. The families of the soldiers thank us for coming to visit as do the soldiers. They are surprised and gratified by the visitors from Canada. The injured I see are not much older than my own daughter who is just about to attend university in Canada. They are kids who have taken on tremendous responsibility. Not a complaint can be heard. The corridor outside the rooms are filled with other young soldiers, teenage girls in the Bnei Akiva movement and others bringing sweets and other gifts. We speak to injured soldiers and civilians alike. We see those with injuries ranging from broken limbs to shrapnel and other wounds. 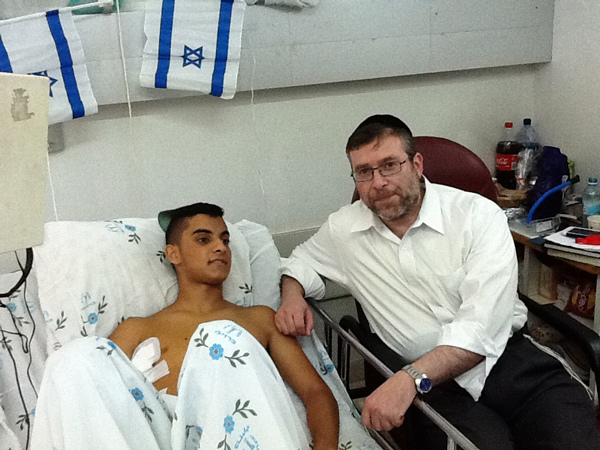 Those on the mission offer comfort and wish all a refuah shlemah (speedy recovery). 11:30am: We thank hospital staff for the wonderful work they are doing to heal the sick and injured. Walking to the bus, the Mediterranean Sea is clearly visible, deep blue, peaceful and beautiful. 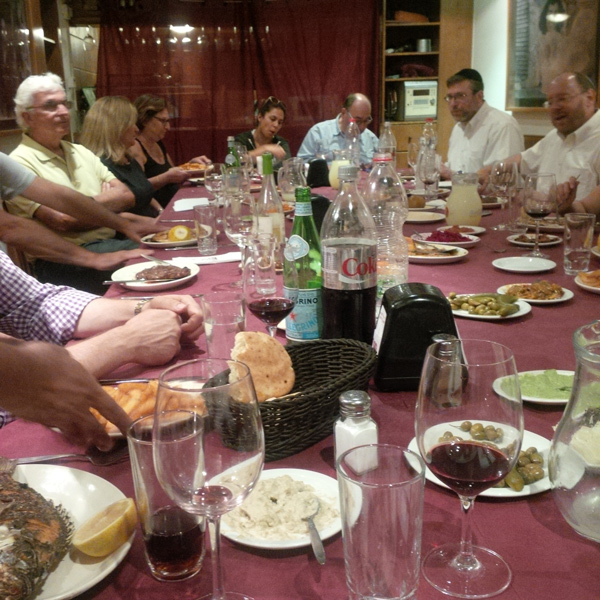 12:10am: The group is eating lunch at an outdoor plaza in central Ashkelon, when a siren goes off. Participants scramble for cover. In my case, and for a couple of others beside me, it's not clear where a safe area is so we run under a walkway cover between stores in the plaza. We hear two loud booms. At this moment, in an instant, the toll these constant sirens take on the people of Israel becomes much more real. I have enough difficulty looking for a safe place for myself. I imagine what it's like for those who have to make a run for it, day after day, many with young children in tow. Then a woman motions us to run a few steps to a safe room behind one of the stores. A couple of minutes pass and we are cleared to walk out of the room. As I look into the sky, there are two streams of smoke from the earth to the sky. I assume it is the stream left by Iron Dome defensive missiles, launched to intercept the incoming missiles. 12:45pm: Mission participant Jack Frieberg has a son in the IDF. Jack has not heard from his son for a few days and, understandably, has been very worried. He informs those on the bus that he just received a text message from his wife, who is in Canada, that she is on the phone with their son and he is fine. Later, Jack speaks to his son. A weight has been lifted. 1:00pm: After driving to Ashdod, just north of Ashkelon, we arrive at ELTA Systems complex to gain a view of Israeli technological innovation that is saving countless lives, as the Iron Dome radar system is manufactured here. We are told that the booms we heard during lunchtime in Ashkelon were the firing of the anti-missile missiles and not the interception of incoming missiles. That collision makes more of a soft hissing sound, as it's audible from the ground. 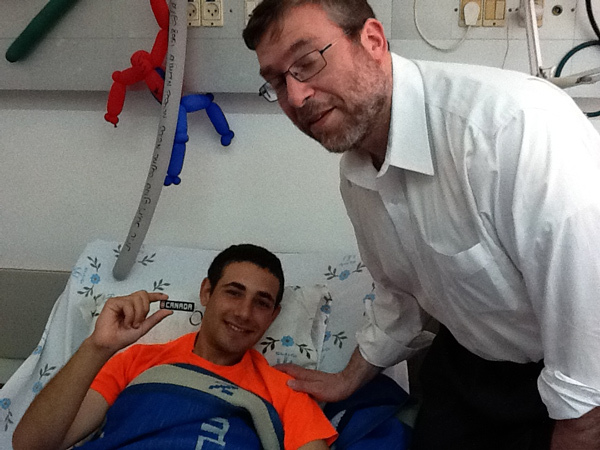 1:45pm: Our guide Tzvi has been able to arrange for Jack to visit with his son. Roads to where his son is stationed are closed but Tzvi knows someone who has a brother in a community close by who is able to arrange for Jack to get through. Jack is in a rush to get a cab to take him to the area. A better father - son reunion could not be imagined. 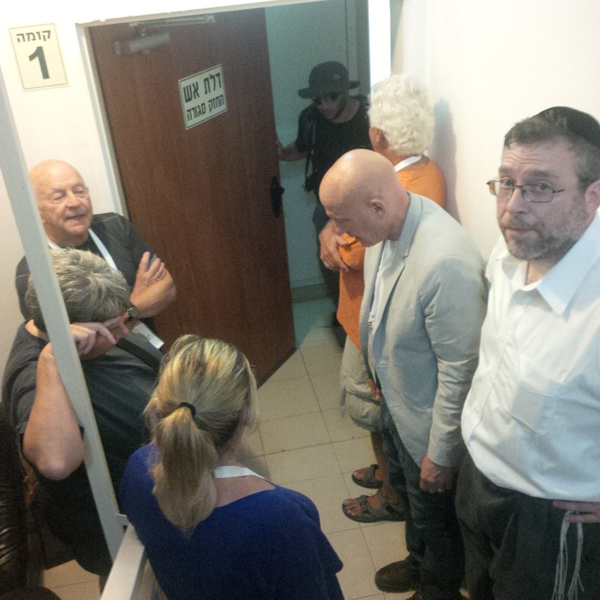 3:00pm: The Mission visits the Jewish Agency Absorption Centre in Ashdod. We sit in a circle and listen to the stories of those who are new immigrants to Israel and how their successful integration is being ensured by the Jewish Agency which is funded by Federations across Canada and around the world. We finish with the story of an immigrant from Cuba with an autistic son who, for the first time, is able to get her son the treatment he needs that was unavailable in Cuba. He is thriving in Israel. We are also reminded that through the Jewish Agency, Federations have played a key role in the successful absorption of more than three million immigrants to Israel since 1948. The new Israelis in the room all express pride at being in Israel and great hope that they can contribute to the country. It's clear that Israel continues to be a haven for the Jewish people, even at a time of war. 4:15pm: We arrive at a beautiful apartment complex in Ashdod. We are told that we are here to visit a family whose apartment was hit by a rocket within the past few days. 4:20pm: We enter the apartment and meet a family of four - a mother who is due to give birth to the family's third chid in the next month, a father, young son and daughter. 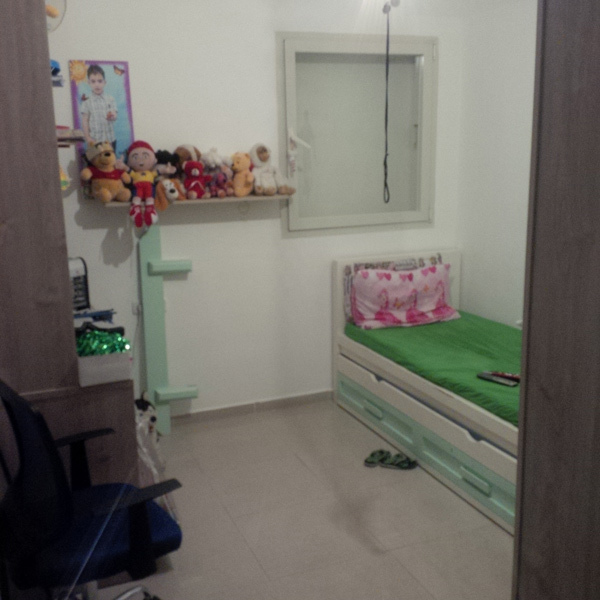 They express that they want people to come and see the apartment and visit them. 4:25pm: The mom tells the story. The siren went off and the family ran in the safe room and shut the door. Shortly after, a huge bang was heard. A missile had slammed into the outer wall of their apartment unit. Glass, shrapnel and other debris flew into to their apartment unit's living room. All were scared and the children continue to be anxious. Pieces of shrapnel are passed around and it is clear than any one piece could have been lethal had the family not made it to the safe room. 4:45pm: As we walk out into the parking lot, we admire the strength of this family. While outside, the fifth siren of the day rings out. A number of us sprint for the building we just came from. We don't have time to get to a safe room so we huddle in a stairwell until it's safe to leave. 7:30pm: Here we are at the last dinner and official program on a Mission that has flown by but included so much, and added tremendously to our understanding and appreciation for Israel, its people and the challenges it faces. As we enter Magunda Restaurant in Tel Aviv I see my colleague David Weinberg who heads up the Centre for Israel and Jewish Affairs' Israel office. David shares a message with me from his son, a combat medic, who just sent David a text saying "I'm ok". Another weight is lifted. David shares that story with the group, talks about the role of CIJA and gives his views on what may happen the day after the war is over. Also on the theme of all Israelis being connected, David tells the group that his family lives down the street and is friends with the family of one of the three kidnapped Israeli students who was murdered a few weeks ago. 8:45pm: Lorne Klemensberg of Routes Travel, the Israeli tour agency for the Mission, tells participants that when the Israeli Minister of Tourism heard about the Canadian Federations Solidarity Mission, he was impressed and had certificates completed thanking each individual particpant for coming to Israel. The certificates are on a table in the restaurant. Again, all of us feel we should be the ones doing the thanking. 9:10pm: Most of the Mission participants have left the restaurant as Jack Frieberg enters. 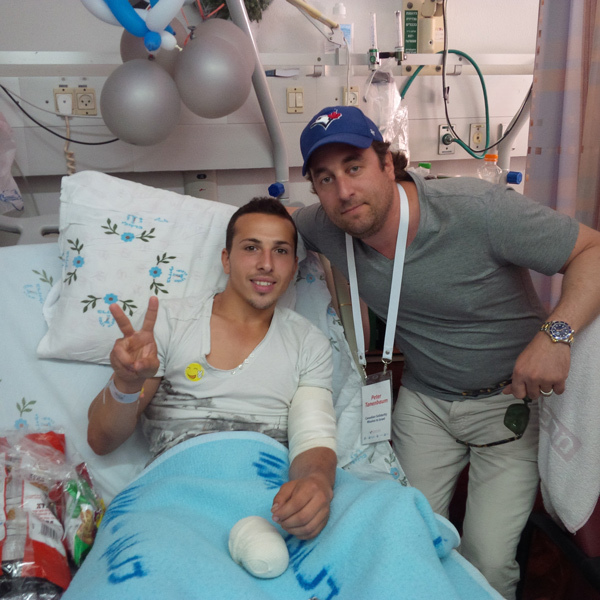 He just returned from visiting his son and got a lift back to Tel Aviv from a family who was also visiting their son. Twenty minutes south of Tel Aviv they stopped for a coffee at a roadside establishment and sirens went off, requiring them to move into a safer area of the structure. Jack shows photos of his special time with his son. 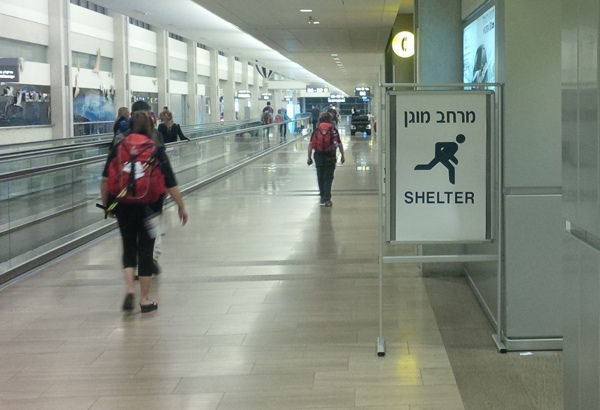 3:30am (July 24/14): I am at Ben Gurion Airport with several others on the Mission who are on the same flight. We had to change our flight from an Air France flight, Israel to Paris, to an El Al flight to Paris, where we will get connecting flights to Canada. Despite the fact that most non-Israeli carriers are not flying from Israel today, the airport is busy and full of life. The reality of war cannot be forgotten as shelter signs are everywhere. 4:00pm Toronto time (July 24/12): As I arrive in Toronto, I am thankful, despite the fact my luggage appears to be taking an extended vacation in Paris. I am thankful for Mission participants who, without exception, were an absolute pleasure to be with and showed leadership by answering the call to go to Israel on a Mission on a few days' notice. Not one complaint was received amid itinerary changes, repeated sirens and airline rescheduling. These were all leaders who, through their Federations, support their local communities, Israel and the Jewish people around the world. At various times during the Mission, they all voiced tremendous thanks to Israelis and for the opportunity to be in Israel as we are all one family. Despite the severity of the situation, in many ways this was the most uplifting Missions I have been on. I saw how the work of Federation makes life better for so many Israelis and how that's being augmented by special funds being raised during this time of conflict. I was also strengthened by the resolve of Israelis. May we all pray for true peace.